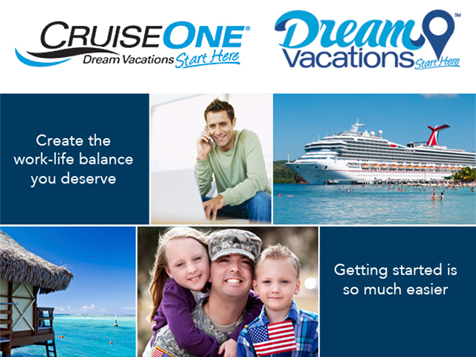 What does a CruiseOne / Dream Vacations Franchise Cost? Our flexible "work-from-anywhere" environment and the excitement of the travel industry appeal to just about everyone. Owning a Travel Franchise is the perfect opportunity to explore business ownership with tremendous rewards. So take that first step today. A Powerhouse in the Travel Industry - As part of World Travel Holdings, we’re the world’s largest cruise agency. Gain unrivaled buying power helping you stand out from the competition. We’re in the TOP 3% - Ranked among more than 4,000 operating franchise systems worldwide. Highest Commissions - You’ll earn 100% of the industry’s highest commissions, paid weekly. Exclusive Pricing &Promotions - Wecontinually invest $600,000 a yearon your behalf, providing clients with offers found nowhere else. 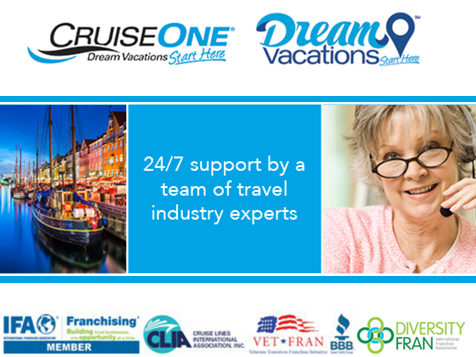 No Travel Experience Necessary - Most of our franchisees have no prior industry experience, but they have one thing in common, a passion for travel and an entrepreneurial spirit! Our Customers Love Us - Franchisees have a 20% increase in repeat clients and a 96% customer satisfaction rating. Your franchise fee includes unlimited mobile-friendly websites that are customizable for your business. We also provide online marketing tools, direct mail,videos and a social media program. With public relations support you’ll gain local and national brandingand our in-the-field business development teammeets with you in person to support business growth. Full training is provided during a 6-day program - located in the cruise capital of the world, Fort Lauderdale, FL. Plus, dynamic continuing education is available 24/7 via on-demand courses and certifications. Our support staff to franchise owner ratio is 1:10 – the strongest ratio of any travel franchise! We are available 6 days-a-week via phone, email or instant chat with extended service house. Recently, we’ve invested an additional $1.5million dollars in technology enhancements, to stay cutting edge. Ourplatforms include a well-equipped CRM, proprietary reservation system and a private intranet and are available anywhere in the world with an internet connection. We offer 20% OFF the franchise fee to U.S. Veterans, and as part of our DiversityFran initiative, we offer 10% OFF. Top that off with our flexible financing, we make becoming a franchise owner easier and more affordable than ever!